Armed with headphones, mics and glasses (the last piece a nod to my printing out my notes with smaller than usual fonts) it was a very fast paced two days. I met up with my good friend Brian Heinin who was also taking part in one of the panels and we hung out that evening too – crashing the London Tech Week party in Shoreditch where we met up with fellow Irishman Shane Kehoe of SVK Crypto – the leading crypto fund in London. Shane is an amazing man and his company is leading the way in all things crypto in London. He hosts monthly meetups (where almost 1000 people attend) and produces daily updates on the crypto market. His company also announced last week that they were partnering with BlockOne, the organisation behind the EOS blockchain, to jointly administer a $50million fund. It’s all big numbers in crypto. 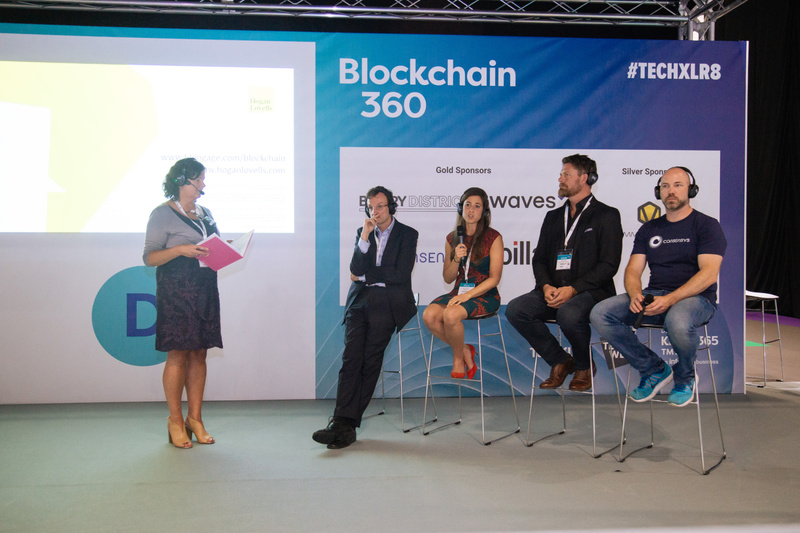 Highlights of the Conference was a panel on regulation which featured Brian, founder of a Blockchain Europe group on Linkedin, John Salmon (legal) Hogan Lovells, Nicole Sandler (legal) Barclays and Jeremy Millar (chief of staff) ConsenSys (which was co-founded by the co-founder of Ethereum and also recently opened offices in Dublin).